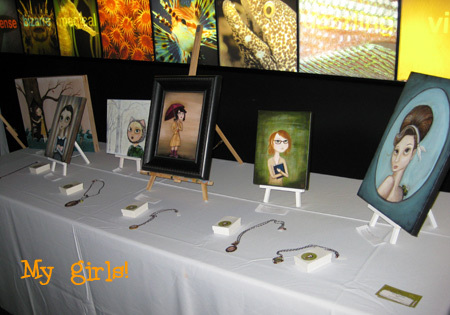 I had a fabulous time at the Art SEA event at the Vancouver Aquarium last night. The organizer, Monika Bilchar, did a great job bringing together totally diverse artists in a beautiful space. I met so many wonderful people and much fun was had by all. 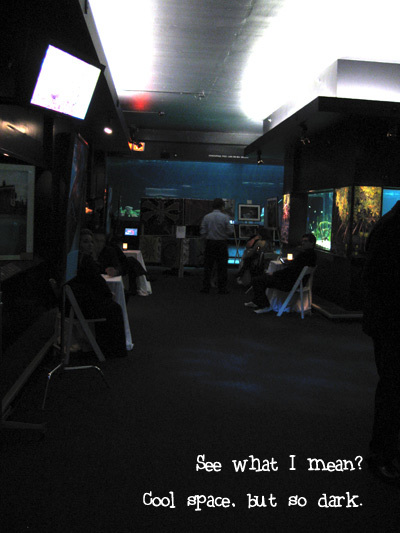 The only downside was that being an aquarium and all, it didn’t exactly have gallery lighting. The middle atrium part and one wing were well lit, but the area I was in, the entrance to the Tropical Zone, was really dark. I unfortunately didn’t get a chance to snap any pics of the rest of the space (or art) because my camera batteries died, oh about 7 pictures in. I was particularly bummed because the octopus was out! Every time I go to the aquarium that pesky cephalopod is hiding and I can barely see a tentacle, but last night he was stuck to the glass. Awesome. 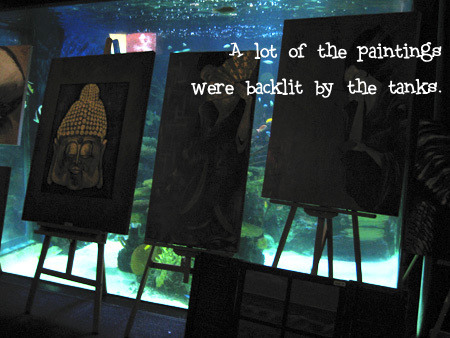 I kept waiting for a painting to get knocked over while someone tried to peer around and into the tanks. And no, I didn’t knock anything over! 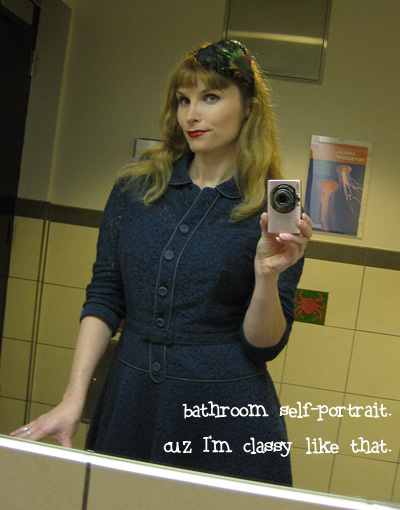 I was rocking my favorite vintage dress that is finally getting that thrift store stank out of it. I’ve soaked it in the bathtub, tried it in the dryer with fabric softener sheets (which almost killed it), hung it outside…that faint moth ball-y smell remains. Wearing it seems to be the only thing doing the trick. It’s about 95% gone now. And so cute! I had four paintings framed for this event, including the Crow Keeper up above. I want to shoot better pics of them without the harsh flash, but even so…wow. What a difference a frame makes! I’d really love to frame all of my paintings. It’s tough though; a frame can cost as much (or more) than the art itself and I don’t get any kind of wholesale deals since I have no need to buy them in huge quantities. One day! I love your paintings! 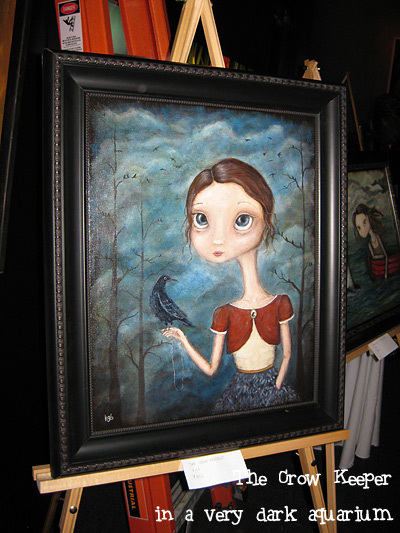 The crow keeper is wonderful..love the background behind her too..amazing! Love your vintagey cool outfit 🙂 Congrats on the show!